A few weeks ago I thought for sure that I would spend my birthday this year in quiet misery. Thanks to all my dear friends and family, this one turned out to be one of the most special birthday I enjoy in a very long time. The celebration started a week ago when E took me out to dinner. Next came a dozen of long stem roses from BigMouse and a card from Dad. Then it was dinner at Amuse Bouche with L, E, A, and T. I received a CamelBak from A which has been on my wishlist for the longest time. Now I can blade more comfortably. It's so thoughtful of him! On the day of my birthday, my team took me out for an Indian lunch. S sent me a gorgeous basket of flowers that smells lovely. Although I've met Auntie D only a few times, she got me a present and when I called to thank her, we chatted a bit. I also got birthday emails from long-time buddies JH and AL. Last but definitely not least, I received an avalanche of well wishes from my cowokers. I'm so glad I get to share some birthday cupcakes with all these wonderful people in my life. Thank you everyone for making me feel like the most special girl in the world! After some planning and a few days of hardwork, I completed over ten dozens of cupcakes on time for my birthday. A few years ago, I decided to start my own tradition for treating my friends and family to cupcakes on my birthday. Well, I've carried on that tradition proudly and this year's production has been my most ambitious attempt so far. I'm very happy with the result and in the process, received an overwhelming outpour of well-wishes from my friends and coworkers. What a wonderful way to start! Carrot cake with white chocolate cream cheese frosting, garnished with marzipan carrots: very moist carrot cake recipe from Rose Levy Beranbaum's The Bread Bible. The frosting from Beranbaum's The Cake Bible is easy to work with and tastes wonderful. 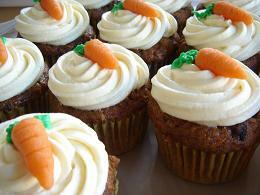 I've finally found an excuse to make marzipan carrots...the leaves are piped with premade green icing. Quartre-quarts au Chocolat with Whipped Dark Chocolate Ganache, garnished with chocolate shard: This is my favourite chocolate pound cake recipe from Dorie Greenspan's Paris Sweets. It is made with creme fraiche and dark chocolate with an additively melting texture. 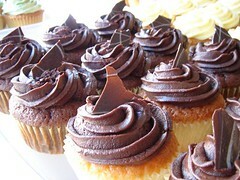 The whipped ganache does not have the richness and smoothness usually associated with ganache but it is nice to pipe. I will stick with unwhipped ganache next time. Coconut Cake with White Chocolate Cream Cheese Frosting, garnished with Coconut Flakes: The cake recipe is adapted from Ina Garten's recipe. 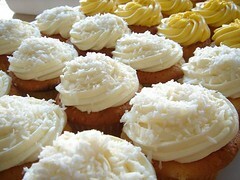 I replaced with almond extract with coconut extract and the buttermilk with sour cream and coconut milk. The cake rises into a beautiful dome with a tight grain. It doesn't taste as good as my coconut adaptation of Beranbaum's All-Occasion Downy Yellow Butter Cake but that recipe is better suited for layer cakes. 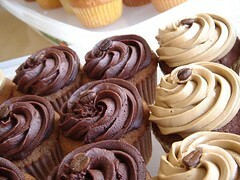 As a cupcake, it rises too much for an attractive appearence. Coconut Cake with Mango Buttercream: Buttercream is Beranbaum's Mousseline Buttercream (italian meringue buttercream) chosen for its stable nature at room temperature. 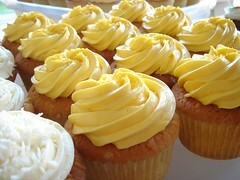 The buttercream is flavoured with alphoso mango puree which gives it a lovely sunny yellow hue and incredible flavour. Coffee Cake with Coffee Buttercream: Coffee cake is adapted from Beranbaum's White Spice Pound Cake. Instead of the spices, I used 3 teaspoons of Illy ground espresso and 2 teaspoons of cocoa powder and replaced the brandy with kahlua and vanilla. The result is a mellow coffee flavour that is not too overpowering. 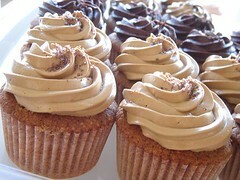 The buttercream is flavoured with instant coffee and kahlua. Lemon Cake with Lemon Buttercream: The cake recipe comes from Paris Sweets' Cake au Citron which mixed like a genoise enriched with creme fraiche. The buttercream tastes awesome. It is Beranbaum's Neoclassic Buttercream mixed with almost equal parts to Pierre Herme's Lemon Cream. The lemon cream is basically lemon curd beat with soften butter. Very rich but bright with lemon flavour. This lemon buttercream is a winner. 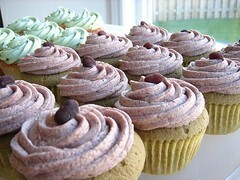 Green Tea Cake with Anko Buttercream: This is another adaptation from the White Spice Pound Cake. The spices are replaced with 4 teaspoons of powder green tea and brandy is replaced with vanilla extract. 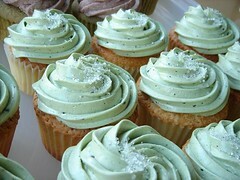 The texture is so delicate plus the subtle flavour of the original recipe allows the green tea to really shine. The anko buttercream is the result of a sudden flash of brilliance. I mix prepared sweetened koshi an with mousseline buttercream. The buttercream is super easy to pipe and lightened the dense anko. Very tasty and very wafu indeed. I will probably make this cupcake again before my next birthday! Coffee Cake with Whipped Dark Chocolate Ganache (left), Quartre-Quarts au Chocolat with Coffee Buttercream (right): different combination of cake and frosting. I was originally going to garnish them with chocolate-covered espresso beans but all the cafes around my house ran out of stock. Vanilla Cake with Pistachio Buttercream: The vanilla cake is a variation on the Cake au Citron. 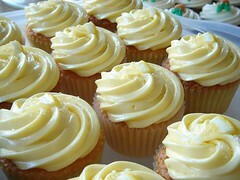 I am stil in search of a better vanilla cake recipe for cupcakes. The mousseline buttercream is flavoured with pistachio paste that I reheated slightly in the microwave. I tempered the paste with a little buttercream for easier incorporation. Both the colour and flavour scream pistachio. Vanilla Cake with Strawberry Buttercream: The buttercream is flavoured with strawberry puree. 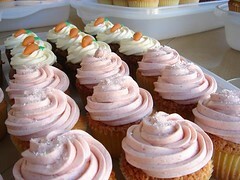 If I want a pink buttercream, raspberry puree would be more vibrant while strawberry is more pastel. Personally, I like raspberry better. That's it for another year of cupcake extravaganza. Which one do you like best? With these two signature lines each catering to North American and Southeast Asian palates, I think it would be a rathering interesting business concept. Did I Hit Rock Bottom? If I view my time spent with J without any rose-colour lens, I think that's really all it came down to. So what if he did wrote me a few sweet letters? He never gave me his full attention. When we tried to make plans to go out, it always ended with "let's play it by the ear" and nothing came out of it more than a few times. I protected myself by making plans without him and simply invited him to join if he chose to but never expected him to come through. I do not deserve to be treated this way. A very irrational thought came into my head. I want to confront him to admit that I was nothing more than a distraction when we went out. I think hearing those words would finally release me so I can move on. I know I'll not act on this urge but still, I want to see blood spilling from my wounds. I finally got tired of eating the same thing day after day. Today, I made a lazy version of chana masala which turned out to be quite tasty. I'm not claiming that this is anything near authentic...after all, I'm better at baking than cooking. However, it is easy and doesn't require lots of clean up. Mix everything in a large container. Heat up individual portions in the microwave. I know, I know, this is not much of a recipe but it does taste very good not to mention high in fibre. I ate mine with mini whole wheat pita pockets. Now that I've started blogging about my food intake, I suddenly notice that I've become (almost) vegetarian since beginning of August. I don't purchase meat anymore in my grocery runs other than the occasional canned tuna and sardines (for Omega-3 and iodine supplement). The only chance that I would consume meat is when I eat out which isn't all that frequent because it's difficult to control portion and fat intake. Mind you, I have no aversion towards any kind of meat at all. In fact, I still have a healthy craving for steak tartare. It's just that when I grocery shop with diet in mind, I ended up getting vegetables, fruit, nuts, legumes, bread, cheese (that's my weakness), and dairy. Becoming vegetarian accidentally is strange indeed. After a two week hiatus, I'm finally back on my blades. My ankle is still slightly swollen but it doesn't hurt unless I press on it. Since inline skating doesn't put stress on the ankle (after all, the boot is designed to prevent ankle movement), I went blading at Martin Goodman West today. More accurately, I started my day at Martin Goodman West. I skated west on the trail until I reached the end at Mimico. I turned back and skated east into the wind. The wind was really strong today, and wow, that was exhausting. I felt as if my legs were moving through fudge. Since it's been a while since I last skated, I wanted to take it easy today and turn back after the uphill climb at Argonauts Sailing Club. After the climb, I didn't feel like stopping so soon so I kept on going. There was a detour of the trail due to construction so I ended up skating much slower than usual on the sidewalk. When I reached my usual turn back point at the HMCS York, I was overtaken by curiosity. It was still early and I'm much more confident now with my blading skills to weave in and out of traffic so I kept on going. I bladed along Queens Quay, past the Harbourfront Centre, turned north at York, bladed northeast until I reached Salad King at Dundas and Yonge. At this point, I wasn't even keeping track of the distance anymore. I didn't intend to skate for such a long distance today so all I carried with me was my driver's license, thirty dollars, car keys, and mobile phone. I wanted to stop for dinner at Salad King but I felt a little weird to just walk in with my socks. Well, what a heck, the staff knows me and I hope they didn't mind (too much). I had a dinner of beef satay, phud thai, and mango sticky rice. That was a lot of food but I polished them off no problem. After dinner, I bladed back with renewed energy. My strides were in much better form and I picked up speed quite easily. When I reached my car, I felt like I didn't have enough exercise yet so I continued blading to the Humber Bay Butterfly Habitat before finally deciding to call it a day. I guess I made up for my lack of speed with distance. I have no clue how far I bladed today. Must be over 40km. I had an absolutely horrible day yesterday. For no particular reasons (none that I could think of anyway), I fell into a deep depression. The day just went on and it got worse. After a few unsuccessful attempts at having a good cry, I couldn't stand it anymore and went out for a drive to the pharmacy. Since I got a case of allergy as well, I bought some Benadryl and took it when I got back to the office. I responded very strongly to Benadryl as usual. It basically put me into a complete stupor. On the bright side, I was so comfortably numb that I wasn't much bothered by the depression anymore. Unfortunately, I had to cancel my plan to go salsa dancing in the evening because I basically passed out as soon as I got home. Wow, the power of Benadryl.